The national apartment market continued its unprecedented strength in September 2015, achieving 5.2% annual effective rent growth, the highest since July 2011 (5.3%) and the eighth straight month the rate has been 5.0% or higher. September’s rate was a 6-basis-point (bps) increase over August’s 5.1% and exactly 100 bps more than the 4.3% of September 2014, according to apartment market research from Axiometrics. The portfolios of publicly traded apartment REITs have been one of the biggest success stories in the market. Nationally, the REITs reported 7.0% annual effective rent growth in September, the highest level recorded since Axiometrics began reporting the metric. Whereas 2014, “The Year of the Apartment Market,” featured rapidly rising rent-growth rates, increasing from 2.8% to 5.0% and rising in 11 of the 12 months, the metric has remained extraordinarily steady so far in 2015. Annual effective rent growth landed within a 17-bps range each month from February through September, with a low of 5.0% in May and a high of 5.2% in September. In other post-recession years, the rent-growth rate tended to decrease in the second half of the year. 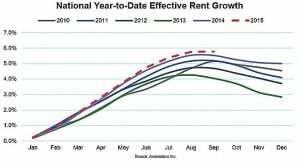 That still could happen this year, but Axiometrics’ forecast is that the national apartment market will record year-end rent growth of more than 5.0%. Strong demand for apartments is also driving heightened occupancy levels. The nation’s apartments were 95.3% occupied in September, a 10-bps decrease from August’s 95.4% but the third strongest month this year. 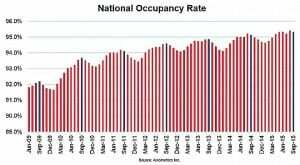 Last month’s occupancy was the highest of any post-recession September. 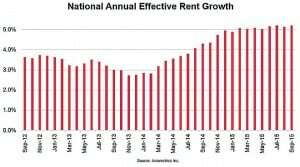 2015 YTD Rent Growth Strongest So Far of Recovery A measure of the national apartment market’s Herculean strength in 2015 is the national year-to-date (YTD) effective rent growth rate of 5.8% in September. That rate is the highest of not only this year, but also of the entire post-recession period. If this year follows the trends of previous post-recession years, growth rates should start to decrease next month. However, 2015 has outperformed every post-recession year for the past six months, and occupancy rates remain so high that there might not be much of a slowdown. The October YTD rent growth would need to exceed 5.3% to continue 2015’s streak at the top; a 50-bps drop would be the largest of any September-October comparison since 2010. The issue of affordability has become more of a hot topic as the apartment market has experienced strong effective rent growth in the past two years. 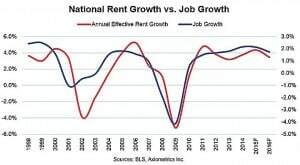 National annual effective rent growth was 5.2% in September and has averaged 4.1% nationally since January 2011. 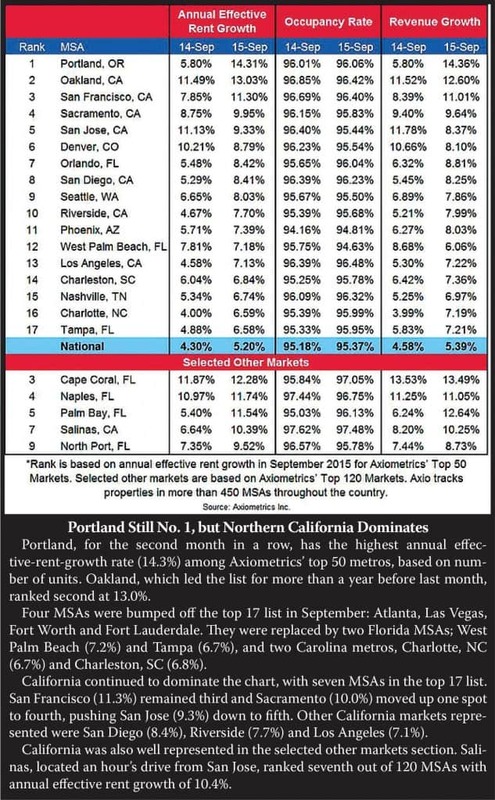 Several West Coast markets have enjoyed double-digit (or just below) rent growth for more than a year. Most notably, annual effective rent growth in Oakland, CA has averaged 13.9% since September 2014. This begs the question: How much can rents be raised before renters start having a problem paying that rent? 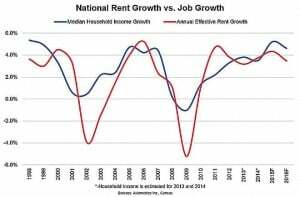 The main driver of effective rent growth is job growth, and steady job growth has supported the national apartment market’s strengthening in 2014-15. However, job growth does not equate to wage growth or, by extension, household income growth. If a potential resident’s pay doesn’t increase as rents do, that person will struggle to afford that class of apartment. Median household income growth includes both wages and any other income – providing insight into how much money households could potentially spend on housing. Annual effective rent growth averaged 2.1% the 10 years before the Great Recession (1998-2008). Median household income averaged 3.0%, so incomes were actually outpacing rents. Since the end of the recession, the average annual effective rent growth rate (3.3%) has passed household income growth (2.8%). But it’s not all about growth. The actual dollars coming into a household versus those being paid for rent are, of course, crucial. In 1998, the national median household income was $38,190 and the average annual rent was $10,016. Housing is considered affordable when 30% or less of a household’s income goes toward rent or mortgage principal and interest. At 27.2%, the national rent affordability in 1998 was considered good. That ratio has stayed below 30% since then. However, that is on a national level. What about markets such as Oakland and Portland? In September, Portland’s annual effective rent growth was 14.3% and Oakland’s was 13.0%. The Oakland-Hayward-Berkeley Metropolitan Statistical Area (MSA) median household income has grown at a rate of 2.1% since the end of the recession (2011-2014), whereas effective rent growth has averaged 9.3%. The market has enjoyed stable job growth, but wages are not accelerating as fast as rents. 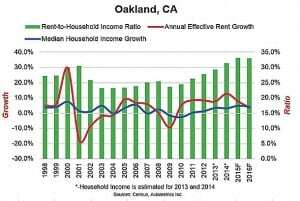 Oakland’s rent-to-median-household income ratio averaged 25.1% from 2002-2013, but increased to 31.3% in 2014. Housing is expected to become increasingly unaffordable in Oakland over the next few years. Of course, with Oakland’s proximity to San Francisco and the higher household incomes there, this may not cause an issue for the MSA’s apartment market, as Axiometrics does expect rent growth to moderate somewhat. 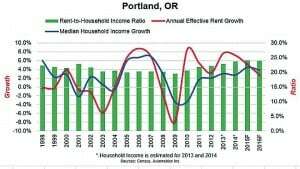 In the Portland-Vancouver-Hillsboro MSA, post-recession rent growth averaged 5.8% from 2011-2014, while household income growth averaged 2.4%. Job growth has been solid over that time period, remaining an average 60 basis points (bps) above the national average. But Portland, unlike Oakland, has not displayed any affordability issues in its rent-to-household income ratio. The ratio has stayed below 24% since at least 1998. Despite Portland’s strong rent growth, housing affordability (as measured by the rent-to-household income ratio) is not expected to become a general issue over the next few years. Important to note is that household income is a median value, and with a population of more than 500,000 people, incomes will vary from household to household. Although affordability is becoming an issue in some MSAs, this will vary from market to market. Linking back to our second graph showing national effective rent growth and median household income growth, it is important to note that when effective rent growth took a big dip during the recession, household income growth – on a national level – did not decline as much. On a national level, there’s still room for rents to grow, and affordability is not expected to become an issue over the next few years. Axiometrics: Axiometrics’ specialty is monitoring the apartment and student housing markets, providing an in-depth view of volatile market trends. Axiometrics’ granular data-collection methods and enlightening analysis help clients make profitable – and intelligent – decisions. To learn more visit www.axiometrics.com, follow @Axiometrics or on LinkedIn, or call 214-953-2242.